A new report on Thursday claims Apple is looking to create a streaming radio service to rival current offerings like Pandora in a supposed attempt to protect its position as the world's largest music dealer. Apple is in talks with content owners to license music to be used in a custom radio service similar to Pandora, according to Wall Street Journal sources. People familiar with Apple's plans said the purported internet-based service will focus on virtual stations to play music on a web browser or dedicated apps, though Android is reportedly not getting access. Advertisements from Apple's iAd platform are expected to be incorporated into the service in exchange for free user access. Customizable internet radio stations are nothing new, as current offerings from Pandora, Spotify, Rdio and others have been active for years, both as internet clients and as apps. Apple too has previously been rumored to have exhibited interest in such a service given its already substantial presence in digital music distribution, though the whispers never panned out. Perhaps most significant are the types of licenses Apple is reportedly going after. Sources said the company is looking to hammer out deals which would allow users to skip songs and eliminate other common restrictions on internet radio services. If such a feature were to be implemented, the alleged service would have a leg up on rivals that charge users a subscription fee in return for unlimited skips. One source said Apple considered competing in the internet radio market in the past as a way to help users discover new music, but ultimately scrapped the plans due to high licensing costs. The company instead turned its attention to the Genius recommendation system, which offers song suggestions based on customer purchases. The sources claimed Apple's most recent discussions appear to be the most earnest attempt yet to get such a program off the ground, but note talks have only just begun and are unlikely to bear fruit for months, if at all. 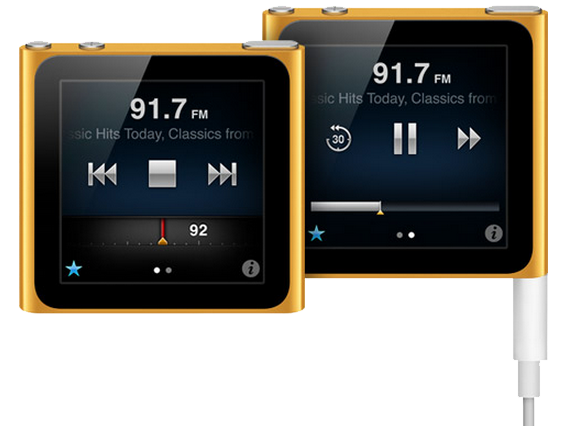 Apple currently offers FM radio on its iPod nano products, while other iDevices like the iPhone can run apps that provide "internet radio channels," or customized music streams based on user-defined preferences. For example, Pandora relies on a "thumbs up" and "thumbs down" method to calculate a user's tastes, referencing likes and dislikes with the so-called "Music Genome Project," a system of assigning songs attributes to give them a "musical identity." It is unclear what algorithm Apple intends to use in customizing users' stations, though it is likely that the company will leverage assets from the aforementioned Genius service.